Jumbo Empanadas: Foodbuzz 24, 24, 24: Spring Has Sprung, Maple Syrup Is Here! Foodbuzz 24, 24, 24: Spring Has Sprung, Maple Syrup Is Here! Spring has sprung, the sap is flowing and it’s time for maple syrup and another Foodbuzz 24, 24, 24 post! Each month Foodbuzz hosts a wonderful event whereby 24 bloggers post about 24 different meal experiences in 24 hours. It was easy for me to pick a topic this month as it’s maple syrup collection time. Canadian cuisine may be difficult to define but one food item that I associate strongly with Canada is maple syrup. And when you live in the country, surrounded by maple trees, it’s impossible not to have an appreciation for the sweet stuff. A memory that I’m sure is shared by many Canadians is a springtime visit to the sugar bush on an elementary school class trip. There you got to see not only how maple syrup is produced, but you also, (and most importantly) got to sample all sorts of maple products. The only problem is that too much maple candy can make anyone crazy. In retrospect, I feel bad for any teacher who has ever had to take their class to a maple sugar bush because that bus ride home is anything but pleasant. Want to know what a maple sugar high is like? Just watch this clip of Friends where Ross and Chandler stay at a fancy hotel, six hours away from home and on the way hit up every maple candy stand they see. Ross overdoses on maple candy and is completely nutty. Now picture Ross, times 30, in child form and you’ve got one of the worst ideas for a class trip ever. But also one that creates lots of memories. 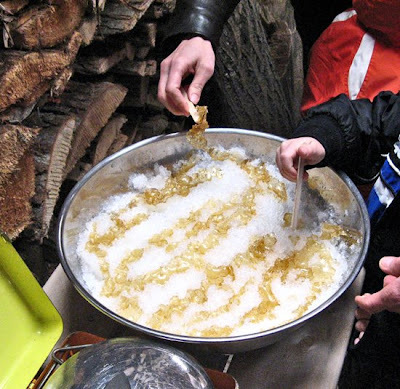 In an effort to recreate some childhood memories, I recently visited a local sugar bush and was treated to a tour of the sugar shack, complete with mandatory maple taffy tasting, (a classic sugar shack treat, made by boiling maple syrup and pouring it over fresh snow). 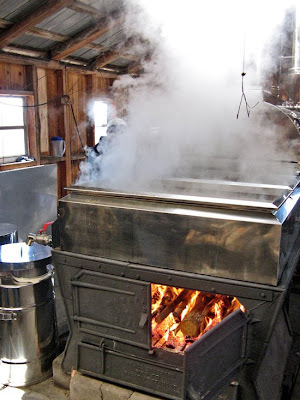 Bob and Mary-Beth Gray of Kemble Mountain Maple Products collect sap from their maple trees and boil it down to syrup in enormous pans, heated by a wood fired stove. The amount of wood they go through in one day is astounding, requiring them to constantly feed the fire with long logs. The fire heats the sap and it reduces, flowing down a gradient, becoming thicker at each level until it can be poured out as syrup at the other end. Tasty, tasty syrup. I left the sugar shack eager to return to my kitchen and to create a meal full of maple flavour. The options were endless but I eventually narrowed my choices down to include a maple flavoured cocktail, salad dressing, two maple glazes and a maple cookie. Let’s begin with the cocktail, shall we? It’s a good one and it’s called a Maplelito, a riff on the class mojito but it’s made with maple syrup instead of mint. 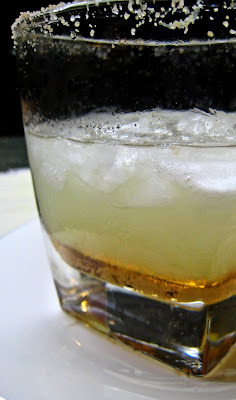 In my version, I combined the juice of 1 lime, an ounce of white rum and an ounce of maple syrup and served it over crushed ice. Delicious. Next up was the salad course. 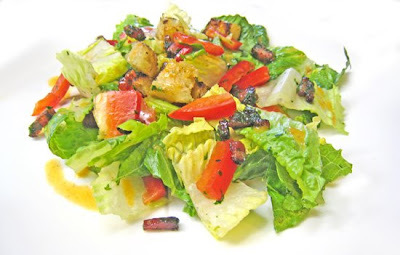 In general, salad is for rabbits, but when you add maple cured bacon, homemade croutons, red peppers and freshly made maple vinaigrette, salad is awesome. The vinaigrette recipe is an inexact science but contained the following: maple syrup, olive oil, white balsamic vinegar, paprika, dry mustard and salt. 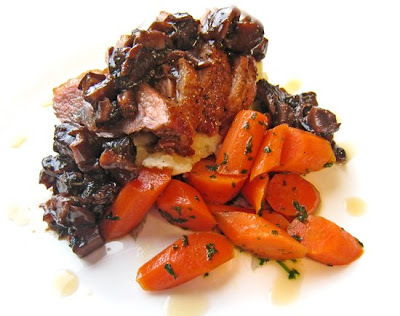 The main course featured a double dose of maple syrup with maple glazed carrots, (recipe from Bon Appetit) and soy and maple glazed duck breast served over garlic mashed potatoes with a wild mushroom ragout. Making the duck breast couldn’t be easier. Simply season on all sides with salt and pepper and score the fat in a crosshatch pattern. Place fat side down in a skillet and allow some of the fat to render out and the skin to become crispy. Drain off most of the fat, flip with duck breast, glaze with equal parts maple syrup and soy sauce and put in a 400 degree oven for about 6-8 minutes, glazing again half way through. Remove from the oven and let rest before slicing and serving. For dessert I made Chewy Maple Cookies from the always enticing blog, Habeas Brûlée. Danielle says these cookies, which were initially created by her partner Dave, are basically maple candy in the guise of chewy cookies. And although mine looked nothing like hers, they were still addictive and definitely along the lines of maple candy. After a couple of these cookies you started to feel a little loopy and doped up on maple sugar. An all around sweet evening. Posted by Brilynn at 11:12 p.m. This post is sooo beautiful! I love your blog and am looking around to see where I can follow! It's a happy memory and it will always remain so. Congratulations on being selected for another Foodbuzz 24, 24, 24 event! Canadian maple syrup is the best. Everytime we have friends from Canada come visit us I ask them to bring a bottle or two because we run out so quickly. Oh, awesome. So often I worry that people think Aunt Jemima's is what I mean by "maple syrup." 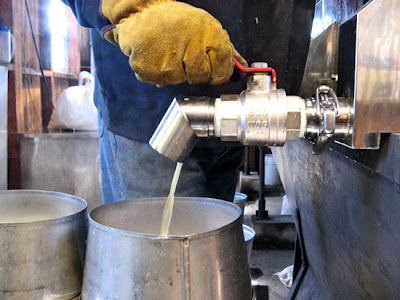 What fun pictures of maple syrup making. I love all the different ways you showed to use maple syrup. It all looks delicious! 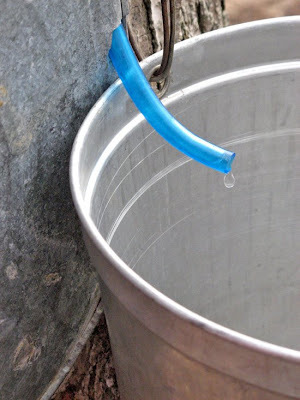 I just read another blog about maple syrup - now I really want some! Those Chewy Maple Cookies sound really good. 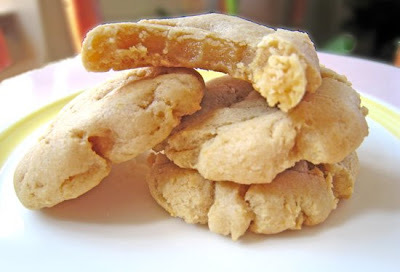 I remember having some awesome maple cookies when I was back east many years ago. I'll have to see if these are similar. I love maple syrup, the real stuff is the only way to go. I want to try those cookies! Oh how I miss maple taffy. I tell people about it here and they look at me like I am insane. It’s looking very yummmyyyy! Can you share the recipes also? Oh girl, bacon/maple dressing! You speak my language!! Look at all that maple wonderfulness! Great post. Neat post! I remember visiting a sugar shack when we lived in Michigan when I was a little girl. Still a fond memory. Cookies look great. Wonderful post! The cookies are going on my to-make list. You can never have enough maple syrup in your life! Adored the post.